The Flemish primitives: What's in a name? In 1902, a large exhibition was organised in Bruges entitled Les Primitifs flamands et l'art ancien. On exhibit were nearly 400 paintings, amongst which were works by (or attributed to) Van Eyck, Van der Weyden, Memling, Bouts, David and Matsys. Over 35,000 people viewed the exhibition. Never before had so many Flemish paintings of this period (15th and early-16th Century) been seen together. Many of the works came from private collections and thus could be seen for the first time in a public context. The impact of this exhibition was unique in scope in that it subsequently stimulated the preservation, acquisition, and research of and on the art of this period and geographic area across all of Northern Europe. 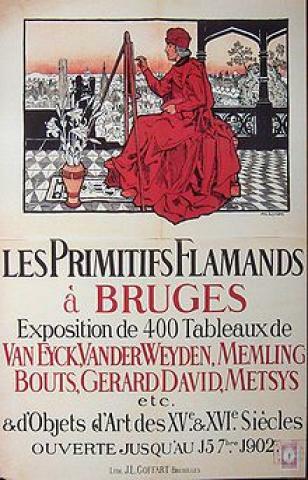 The term les primitives flamands or "Flemish primitives", as used in the exhibition's title, had come into being in the early decades of the 1800s. In the beginning of the 19th Century, this school of painting was called peintures gothiques. Under the influence of Romanticism, the term peinture gothique, or Gothic painting, was abandoned because of a new appreciation of this art. The term "Gothic" would from then on be reserved for architecture and sculpture. The new term primitif that gradually eased into the artistic vocabulary was at first mainly used to describe the naïvité of early Italian painting. For example, it was said of the art of Fra Angelico that it expressed la pureté primitive, or, a "primitive purity". This was not necessarily meant as a pejorative term - the word primitif stood for a sentiment, for frailty and a Christian softness that was embedded in the paintings. In 1842, the Messager des Sciences Historiques de Belgique used the word 'primitive' in a broader context of the Ecole primitive flamande in an enthousiastic reference to the Museé Van Ertborn in Antwerp. And, in 1846, the term first was used by the Académie Royale de Belgique in reference to the painting school école flamande de peinture. A new, appreciative attitude towards this style of painting came out of the Romantic movement and writers such as Gustave Planche (1851) and the great romantic painter Eugène Delacroix (1854) mark an important shift in the comprehension of the old painting school. For even though the arts of this period in Flanders had been greatly appreciated in their own time and had been written about and lauded as early as the 16th Century, during the following centuries this particular style of paintings had fallen into oblivion. It wasn't until the 19th Century that the panel paintings that had been produced at the end of the late-Middle Ages were rediscovered, collected, analysed and interpreted. These scholarly interpretations were divided into two types of discourse: one that considered this art as the very last stage of medieval art, and another that described its technical advances as an introduction to the early-modern art. In part, as a result of placing this art within a historical, geographical as well as stylistic context, a variety of nomenclature was used to denote it. As such, the 'Flemish primitives' were also called Les peintres des anciens Pays-Bas méridionaux, or their art in German Altniederländische Malerei, while in English it was considered Early Netherlandish painting or, when comprising more than the area of Flanders, Northern Renaissance painting. With so many different labels, what then unifies this art of the late-Middle Ages and /or early Renaissance in Flanders? In defining a research area, three aspects can be considered as determiners: stylistic characteristics, geography and chronology. "Flemish painting will generally speaking, Signora, please the devout better than any painting of Italy, which will never cause him to shed a tear, whereas that of Flanders will cause him to shed many; and that not through the vigour and goodness of the painting, but owing to the goodness of the devout person." "In Flanders they paint with a view to external precision or such things as may cheer you and of which you cannot speak ill, as for example, saints and prophets. They paint objects and masonry, the green grass of the fields, the shadows of trees, and rivers and bridges, which they call landscapes, with many figures on this side and many figures on that one. And all this, though it pleases some persons, is done without skilful choice of boldness and, finally, without substance or vigour." Michelangelo was looking at northern art through the eyes of a true Italian Renaissance artist who considered anything other than Italian to be of lesser quality. Yet, in his - albeit rather subjective-evaluation of this non-Italian Renaissance art, he distinguished several of its main characteristics, such as its ability to appeal to the emotions of the viewer and its extreme attention to detail resulting in highly realistic renderings of materials and textures. This was in part possible as a result of the technical advancements in the usage of oil paints. Another main characteristic is the symbolic, religious and, in many cases, even mystical dimension imbedded into objects of daily life and the natural world within the painted compositions. These stylistic features-also known by the term Ars Nova, as indeed a new type of art was developed-are thus the main determinant to label an artist a Flemish primitif. What to make then of the terms Netherlandish or Flemish or Northern? Placing a period of artistic production within a defined geographic area proves to be somewhat problematic, especially since the names of these areas have changed throughout history. Terms such as the Netherlands and Flanders do not have the same geographical boundaries today as they did in the 15th Century. Netherlandish Art thus comprises a larger area of production than Flemish Art, yet Flemish Art does not denote artistic production solely in the area of what is present-day Flanders. Often a distinction is made between the northern and southern Netherlands when discussing artistic production in the 16th Century, however, this distinction is not completely justifiable in the historical treatment of the 15th Century. An alternative methodology is to consider artistic production in terms of its main patronage such as the Burgundian court. The geographic area over which the court had dominion, namely the Burgundian Netherlands (an area encompassing the Low Countries-current-day Belgium, the Netherlands, and Luxemburg-and northern France) then determines the geographical area in which a certain type of artistic production took place. The House of Burgundy reigned over the Burgundian Netherlands area from about the end of the 14th Century until the end of the 15th Century, which also provides us with a clearly defined historical period for Burgundian art production. Indicating the period in which certain stylistic characteristics were prominent on a time line might seem fairly straightforward at first. However, rarely do stylistic periods have clearly identifiable beginnings and endpoints. Moreover, often scholars do not necessarily agree on the (generally rather subjective) identification of a stylistic beginning or endpoint. For instance, whereas many scholars have discussed the Ghent Altarpiece as the beginning of a new stylistic period, Erwin Panofsky (1892-1968) placed the beginnings of the Flemish primitives not with this major work but already in the 14th Century. And, whereas certain critics and authors such as Paul Mantz (1821-1895) and Alfred Michiels (1813-1892) described the art of the Van Eycks as a new beginning and the start of modernism, Johan Huizinga (1872-1945) viewed their art as evidence of the last gasp of the Gothic world. Considering artworks purely from a chronological perspective-for instance, the arts of the 15th Century (thus from 1400 - 1499)-is of course too artificial, as stylistic trends do not change according to the calendar. Yet, when we speak of 'Flemish art of the 15th Century,' it is clear that the Flemish primitives are intended. Often major historical events are taken as the beginning and endpoint of a period within which a particular type of artistic production took place. Or, as already mentioned, this refers to the period in which a certain ruler or court influenced culture and the arts. For instance, the flourishing of the arts in the courts of King Charles V of France (r. 1364-80) or the Holy Roman Emperor Charles VI (r. 1347-76) are often considered as the beginnings of Northern Renaissance art. An event such as the Iconoclasm of 1566-67 after Martin Luther's Protestant Reformation clearly influenced artistic production in a dramatic way so that this moment can be used either as the endpoint of one type of production or the beginning of a new development in the arts. From this brief explanation, it is clear that in the case of a website such as this, even with a seemingly self-evident title, The Flemish primitives, it is not necessarily entirely evident which artists, period, and geographical area are included. As with any other art historical publication, a caveat concerning the demarcation of the period and geographical area as well as artists included, is also thus necessary for this website. The reader will remember that the term Flemish primitives came about in the 19th Century. Since then, many reconsiderations have taken place in order to more accurately name the art with which we are here concerned. Indeed, the adjective Flemish is often too limited to indicate the artists (for instance, not all artists were of Flemish origin but came to the area to work, such as Hans Memling). In addition, the word primitives does have a certain negative connotation and more recent scholarship aims at eliminating subjective terminology. However, the label Flemish primitives certainly has historiographical relevance and throughout time it has become one of the most recognisable terms amongst scholars and the general public alike to indicate this particular style of art. It is for these reasons that this title has been chosen also for this website. This website is an initiative of the Flemish Art Collection, an umbrella organisation stimulating the collaboration amongst the various art collections in Flanders and stimulating the international promotion of these collections. The artworks included in this website, are the artworks housed in the museums of Antwerp, Bruges, and Ghent and other collections and churches in Flanders. As we have seen above, often the demarcation of an area of research relies on (often somewhat artificial) restrictions, albeit in terms of historical period or geographical area. For this website, the pool from which we draw the artworks - the Flemish art collections - is likewise our first restriction. From these collections, all panel paintings produced after and inclusive of the art of the Van Eycks up until the first Iconoclasm in 1566 are included. This, of course, firmly places us in the 16th Century. We include certain works from the 16th Century for two reasons: firstly, when these works are stylistically strongly related to the art of the previous century, such as for instance Jan Provoost and Quinten Matsys; and secondly, we include certain 16th-century works that are important works of the Flemish art collections - even when they are not directly stylistically related to the works of the Flemish primitives, such as Maarten van Heemskerck and Hans Holbein II. To further clarify why certain works are included in this website The Flemish primitives - even if they are not directly Flemish, or not from the 15th Century, or not stylistically related to the primitives, we have divided the artists into five categories. Category A includes all works of so-called Flemish primitives from Flemish collections. They fit stylistically and were between circa 1420 and 1530 in the Southern Low Countries. Category B includes works from artists from Flemish collections that were active between circa 1420 and 1566 (the Iconoclasm) in the Southern Low Countries. They produced works that stylistically differ from the Flemish primitives . Category C includes all works from artists from Flemish collections that were active between circa 1420 and 1566 (the Iconoclasm) in the Northern Low Countries. Category D includes all works from artists from Flemish collections that were active between 1420 and 1566 outside of the Low Countries. Cyriel Stroo and Pascale Syfer - d'Olne, The Flemish Primitives I. The Master of Flémalle and Rogier van der Weyden Groups. Catalogue of Early Netherlandish Painting in the Royal Museums of Fine Arts of Belgium. Brussels, 1996. James Snyder, Northern Renaissance Art. Painting, Sculpture, the Graphic Arts from 1350 to 1575. New Jersey and New York, 1985. Jeffrey Chipps Smith, The Northern Renaissance. London and New York, 2004. Susie Nash, Northern Renaissance Art. Oxford, 2008. Bernhard Ridderbos, ed. Om iets te weten van oude meesters: de Vlaamse primitieven - herontdekking, waardering en onderzoek. Nijmegen, 1995. Piet Boyens and others, Impact 1902 Revisited. Early Flemish and Ancient Art exhibition. Bruges 15th June - 15th September 1902. Bruges, 2002.